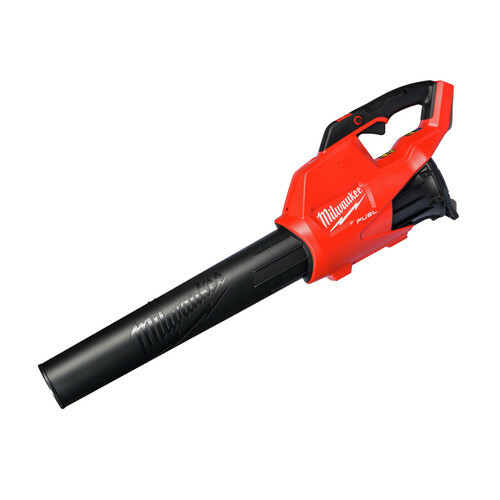 The Milwaukee M18 FUEL 16 in. Chainsaw delivers the power to cut hardwoods, cuts faster than gas, and delivers up to 150 cuts per charge. The unit is designed to meet the performance, durability and ergonomic needs of professional landscape maintenance, power utility, and the installed M18 user. The POWERSTATE Brushless Motor maintains speed under heavy loads without bogging down to outperform small gas engines and higher voltage systems. REDLINK PLUS intelligence ensures maximum performance and protection from overload, overheating and over discharge. The M18 REDLITHIUM High Output HD12.0 battery delivers unmatched run-time in all applications. M18 FUEL technology allows the unit to reach full throttle in under 1 second providing ultimate control and productivity. I have a ranch and am always needing a chainsaw, I have gas powered saws but weight and noise is always a problem. Today I was building a new section of fence this saw came in handy every time I turned around I was able to trim off the tops of the corner posts 6x6 treated lumber it zipped right on thru. I had to trim some branches that were going to be in the way of my new fence no problem. I just couldn't believe how well this saw performed. I highly recommend to any one. I Recommend this chainsaw it’s better than any gas chainsaw that I have used . I let my brother use it and he also went got one! Best Electric Chain Saw Out There!!!! What cant I say about this FUEL Monster?! Cuts through trees and limbs like a hot knife through butter!! Dropped a 50 foot tree, limbed it out, and cut into 24" rounds - all on 1 battery!! Beyond Impressed! Do yourself and your saw a favor, and dont skimp - get the best chain lube you can. It makes a heck of a difference. I bought the M18 Fuel chainsaw with two 12 AH batteries recently at a special price from Home Depot. I have been using it 3 weeks. I was hoping it could replace my gas-powered 16” Husqvarna 345 for cutting small to medium (6”-14” diameter) pinon and juniper trees for a multi-acre forest thinning project in New Mexico. So far so good. This is a project where I cut about 2 hours/day so note this review is not for long hours of daily saw use. Attached is a photo of a patch I cut with the M18. I was leery about claims that a cordless could replace a small gas chainsaw. I am very pleased with the M18 - it cuts with comparable power to my Husqvarna but without the gas, 2-cycle oil, and very loud engine noise. I use it to cut down trees, cut their stumps, cut the branches off the trunks, and cut the trunks into firewood logs. The M18 is responsive, cuts through wood easily as long as the chain is sharp, quieter than a gas chainsaw (not whisper quiet, similar to a circular saw, I still wear ear protection), and has not over-heated. My estimates of battery run time: (1) smaller trees 4”-8” 50 minutes; (2) larger trees and stumps 8”-14” 30-40 mins. A tank of gas in my Husqvarna lasts 45-60 mins depending on what I am cutting, so one 12 AH battery lasts somewhat less. Getting two 12 AH batteries was key for extended saw use. If their price comes down I will buy more batteries. I have not kept track how long it takes to recharge the batteries. I chose the M18 over other cordless brands based on reviews, claims of it performing comparable to a gas chainsaw, its 12 AH battery, and that the bar is attached to the saw with two bolts, which is standard in gas chainsaws. Although I was tempted by other brands that have tool-less chain tensioning, I was worried that the bar would be less solidly attached to the saw. I don’t know if that worry is warranted. If the M18 had a tool-less tensioner and the bar was solidly attached to the saw I would have preferred that setup. My only questions so far relate to how the bar and chain oil is distributed. Oil soaked saw chips stuff the space behind the clutch cover when using the saw. That does not seem to reduce cutting performance but I still remove the cover and clean out the chips every so often. I wonder if that could be fixed with a better design? The other question is that I wonder how well the oil is getting to the bar and chain. When running the saw, oil is not obvious on the chain as it is with my gas saw, and when I point the end of the bar at a light color object like a board and run the saw it does not sling an obvious oil line as with my gas saw. Instead it spits out a scattered small oily spots/saw dust chunks. I have to run the saw through two batteries, about 1-1.5 hrs, for the oil tank level to drop substantially. I removed the clutch cover and bar and ran the saw and it is putting out oil so the oil pump is working. The oiler holes in the bar and the ports from those holes to the bar groove are not clogged, so that does not seem to be a problem. It does not seem like the saw chips that accumulate behind the cover would interfere with oiling since they are above and below the chain, not clogging the bar oil holes. Unless the chips get past the chain and into the bar groove and clog oil dispersal there. I’ve only checked the groove once so far and it did have some some gunk although I did not think it was excessive. I called Milwaukee support and they said that when the M18 saw first came out there were complaints about oil leakage (I read that in reviews) so on newer saws they dialed back the amount of oil put out, and support said it is not a problem. I have not noticed any problem with cutting performance, overheating, or chain bluing and I am glad it does not put out excess oil. On the other hand I worry that if there is insufficient oil, chains and bars will wear out faster. Does anyone have an opinion on this? Also, I am going to try Stihl BioPlus vegetable-based bar oil. Not for this question about sufficient oiling, but because I am just interested how it will perform in the M18. Has anyone tried it in the M18? Some people report problems with vegetable-based bar oils jamming oil pumps or otherwise being inferior especially when cold, but that is in gas powered chainsaws. Anyway, overall I am very pleased with the M18 and will see how well the saw and batteries perform over time. I've used this saw a few times for cutting up pallets. No issues with tork and power as long as you keep the blade sharp. Couple things keep this tool from being a 5star. The chain has loosened up a number of times and the oiler seems to perpetually leak. Both annoying. Should come with a case. I use this Saw everyday and have found that it passes every test. I love that it has a build in saw wrench to put the chain back on and for adjustments. Very powerful and quiet. This is a great saw however it is longer than a gas saw and does NOT fit into any gas cases. I had to wrap this saw up in a garbage bag to protect it from the weather. This is a huge miss by the team at Milwaukee for an item that is ALWAYS available with any other tool they sell. Get on this people. I am blown away with the performance of this chainsaw. This is a real chainsaw, not some piece of disposable junk. I purchased this chainsaw kit to start my collection of 12.0 M18 batteries. I have a herd of 4.0's, and two of the 9.0 batteries, and you can absolutely tell a big difference in not just run time but performance and power as well. Mostly I use the 9.0 batteries between two 5" fuel angle grinders in my fab shop. They become much more of a tool with the bigger batteries. When I saw the announcements early 2018 about the 12.0 batteries and the new tools I knew I would be spending some more money. All I was waiting for was the right deal. I found this deal on the chainsaw kit and a 2nd free 12.0 battery and I jumped on it. No regrets. My dad and uncle have both been loggers most of my life. I've seen my share of chainsaws working with them in the woods and around the house. This little Milwaukee saw keeps up with a stock 40cc Stihl gas saw. Yes, they can be hopped up and tuned to get near to 60cc performance, for a little while, but I'm talking about out of the box performance. The chain is small pitch (requires a 5/32" file), round top Oregon chain on an Oregon bar. Round top chain doesn't cut as fast as square top but it's easier to deal with since it isn't as prone to kickback as square top chain and other more aggressive chain designs. I'll probably be sticking with round top chain on this saw. A tank of bar and chain oil matches battery life on the 12.0 batteries pretty well. The oil flow was what it needed to be. Not a big gooey mess like some have described in their reviews. Chainsaws are nasty little tools, electric, battery, or gas powered. Or maybe my saw doesn't put out as much oil as theirs. Either way it's a non issue for me. This saw has more torque than any little gas saw I've used. The trade off is chain speed. I believe the little gas saws run the chain faster. I have no way to measure this accurately and am just going by how the different saw designs cut. The Milwaukee saw just keeps chewing and doesn't seem to slow down as bad as a little gas saw. It just stays a more consistent chain speed from start to finish on a cut. That took me some getting used to and is not necessarily a good or bad thing. Just different than I am used to. My constructive feedback on this saw would be to use a more typical pitch chain, the scrench is a pita to get out of the saw body, and the saw is a bit long with the battery in the middle of the saw between the handle and the bar. These aren't deal killers for me, just food for thought on 2nd generation saws. Also, a giant Milwaukee Fuel zippered bag should be included with the saw to keep up with the other chainsaw stuff together with the saw. Just sayin. I finally put this thing to real task today. I'm thoroughly impressed! I had a good amount of faith in it but I had no idea how awesome it would be! It'll run on 5.0 batteries if need be. However, for big jobs I suggest buying a second 12.o Ah battery. Otherwise, this thing is great! Does it have a storage case available? Are bars and chains commonly available? BEST ANSWER: Oregon Pt. # R56 for the chain, Oregon has not updated their website yet, but told me in a few weeks they should have the bar Part # available. can you use M18 Redlithium XC 5.0 Battery's as a back up for this saw? Absolutely. The saw will run with any M18 REDLITHIUM battery pack. where can we get an extra chain? BEST ANSWER: I believe Oregon makes the bar. Bomgaars has a good Oregon selection with chains, if you don't have a Bomgaars then you could try Ace. Typically I've not seen as good of a selection for Oregon products for Ace though. my local hardware store makes chains to order and for less. BEST ANSWER: This Weighs 13.9 lbs. So does this special buy offer mean that you get two batteries? BEST ANSWER: Yes, the promotion is for an additional battery. Does it still require bar oil like a traditional gas chain saw? BEST ANSWER: Yes, it still requires bar oil and fills like a traditional gas saw. I love this saw. Nice to set it down and be completely quiet while I move logs and branches around. Yes it does. Bar oil and a full charge, and you are up and running. I really like mine. Yes it does. It’s just like a regular chain saw minus the gas engine. Is the ChainSaw veritable speed? BEST ANSWER: No mine is not. I will tell you this though, it is a man. I would not tale anything for mine. To have that much power and be so quiet is amazing. But it is just like everything else I have made by Milwaukee, tough as nails. yes, it has a variable speed trigger. It can actually run the chain very slow if you wanted to for some reason.Enter an answer to this question. I read in one of the reviews a owner replaced the bar with a Stihl 16” bar. I have a gas powered stihl saw with extra bar, will that work on this saw? You should be able to use a different, to make sure please contact Milwaukee customer service at 1-800-729-3878. Is it quiet enough to use on a Sunday morning without disturbing nearby neighbors? BEST ANSWER: It is not anywhere as noisy as a gas powered chainsaw. Your lazy neighbors will not be disturbed. The item is quiet, so it should not be a problem to operate the item on a Sunday morning.